Children's Picture Book Database at Miami University | There's a cow in the road! As this girl gets ready for school, a cow and many other animals show up outside of her house. When the bus finally comes, there is chaos with people, cars, and animals in the neighborhood. 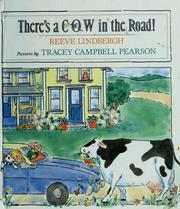 Lindbergh, Reeve, “There's a cow in the road!,” Children's Picture Book Database at Miami University, accessed April 21, 2019, https://dlp.lib.miamioh.edu/picturebook/items/show/10045.